Most of the scientific knowledge on Indian biodiversity is 60 to 100 years old, dating back to the pre-independence era. During this time, there have been tremendous scientific developments in areas such as evolution, molecular phylogenetics, biogeography, and conservation genetics. This has substantially advanced our understanding of the evolution and dispersion of biodiversity on Earth. Unfortunately, much of this development has largely excluded India, which is unfortunate considering the crucial biogeographic role that the Indian Subcontinent plays. India is at the junction of the Palearctic and Oriental zoogeographic regions, and is believed to have been critical in the evolution and exchange of many important faunal elements across these regions. Thus, understanding the evolution and biogeography of Indian faunas is important in constructing a more complete picture of biological diversification in the Palearctic and Indo-Australian Regions. 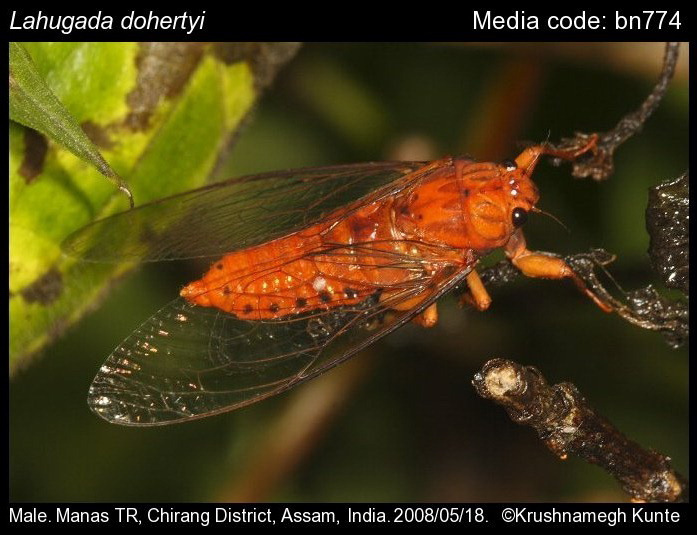 Using cicadas as a tractable invertebrate group, this project aims to: (1) study the origin and diversification of cicadas in India in relation to neighboring regions, (2) generate a higher-level phylogeny of Indian cicadas that will form a backbone of all subsequent studies, and (3) help inventory cicada diversity, including cryptic species, with the help of molecular data. The researchers involved will intensively sample cicadas across the length and breadth of India and will apply DNA sequencing, phylogenetic methods, and recently developed genomic methods. This work should generate valuable new information on the taxonomy, diversity and endemism, biogeography, and conservation needs of cicadas and other invertebrates. With its burgeoning industries, a high gross domestic product, and an already considerable and yet ever-increasing population of technically and technologically well-trained youth, India is poised to become a significant scientific and technological power in the near future. However, the country is struggling to meet the demand for ecologists and conservation biologists. This project will help by supporting two Master’s-level students to study the diversity, taxonomy and biogeography of Indian cicadas, with the aim of promoting the development of indigenous biological expertise and local involvement in documenting and conserving biodiversity in India. Improvements are also needed in the local infrastructure that will complement research in frontier areas of biology. Currently, the best reference research collections on Indian fauna are outside the country, thus keeping certain kinds of research such as species discovery and evolution of biodiversity out of reach for most Indian biologists. The research collection that Prof. Kunte is building at his institution will begin to tackle this issue. This collection already has more than 3,000 specimens, including several dozen cicada specimens, which are well-curated, with geo-referenced data and a DNA library associated with each specimen. The collection is set to have space and instruments for microscopy, high-resolution close-up photography, sound recording, and electronic data archival and retrieval systems. This collection, which is freely accessible to Indian and foreign scientists, will form a major infrastructural resource especially for Indian biologists, boosting the breadth and depth of biological research in India. On September 8, 2015, Dr. Kunte conducted a day-long workshop, “Ecological Monitoring of Tropical Insect Diversity: Field and Lab Techniques,” at the Student Conference on Conservation Science—Bangalore 2015 (SCCS), at the Indian Institute of Science, Bengaluru. He taught a group of 15 students field and lab techniques for studying ecological and conservation aspects of tropical insects, including cicadas. On September 10, he held a two-hour workshop on “Ecological Monitoring and Conservation of Tropical Insect Biodiversity” at the same conference. Approximately 100 students took part, discussing ways in which insect populations and diversity may be monitored in tropical areas, as well as how these studies may instruct us on ecological processes and conservation policy. This workshop especially focused on cicadas, butterflies, and dragonflies as flagship insect groups and discussed interesting aspects of their biology and conservation. Dr. Kunte and his colleagues have recently met with state forest department officials in three states and shared information and news about their ongoing work on Indian cicadas. As a result of these meetings, the team will be working with one state forest department to develop posters and other educational materials highlighting the biodiversity of cicadas and other insects in India. They also met with local World Wildlife Fund members and exchanged news about their surveys and major findings, especially in Arunachal Pradesh. In the closing weeks of the project, Dr. Kunte visited the Natural History Museum, London (NHM) from November 1 to December 15, 2015. NHM has a significant collection of Indian cicadas that he used as a reference tool in his ongoing taxonomic work. Following the close of the PEER award as of the end of December 2015, all of the cicadas collected as part of the PEER project have been curated, representing one of the best modern collections of South Asian cicadas. This includes more than 800 specimens belonging to nearly 60 species from all over India. This collection will expand significantly in coming years but it already represents a valuable resource for phylogenetic and evolutionary work on Indian cicadas. This collection is housed in the National Centre for Biological Sciences, Tata Institute of Fundamental Research, in Bengaluru, India. This is a unique research collection for this developing country, complete with a DNA library and geo-referenced data for the cicada specimens collected so far. Critical species that were needed for the global phylogeny of cicadas have been sequenced and the data communicated with U.S. partner Prof. Chris Simon, who leads an international network of collaborators (this PEER project was in support of the Indian part of Prof. Simon’s NSF-funded work). The team has launched a website on Indian cicadas, a citizen-science project (http://www.indiancicadas.org/), through which they hope to compile information on Indian cicadas on an ongoing basis, make it freely available to all, and help popularize this group in India. Since its launch, the website has been further developed to include features such as a mapping module and image galleries, which have added substantial value. The website now features more than 50% of India’s known cicada species. This fulfills the second most important goal of this PEER award. Summarizing the results of their collaborative research, Dr. Kunte, members of his lab, and researchers from Prof. Simon’s group have produced a synonymic catalogue of Indian cicadas that updates the taxonomy and systematics of South Asian cicadas after nearly 80 years. This paper, which will be an important reference for all future studies on Indian cicadas, has been provisionally accepted by Biodiversity Data Journal. The citation of the paper is as follows: Price, B. W., E. L. Allan, K. Marathe, V. Sarkar, C. Simon, and K. Kunte. 2016. The cicadas (Hemiptera: Cicadidae) of India, Bangladesh, Bhutan, Myanmar, Nepal and Sri Lanka: an annotated catalogue, regional checklist and bibliography. This satisfies the third goal of this collaborative grant. In addition, since it began in August 2013 the project has provided training on insect surveys, data analysis, and specimen curation for the two research assistants involved in the PEER project, as well as an estimated 400 other undergraduate and graduate students through two workshops and three talks delivered at the Student Conference on Conservation Science (SCCS) in Bengaluru in 2014 and 2015.